RPI PLAYERS CREW MEMBERS WORK together to build the set before opening night. I will admit that I’ve never been particularly interested in drama or theater, but after seeing RPI Players’ Evening of Performance, my interest was piqued. After attending one of their work parties, I found that there was a lot more to this club than I initially thought. The RPI Players showcase between three and six plays each year — each of which requires an enormous amount of planning and work, related to set design and production. From the moment the plans are drawn, until the moment the final touches are made, there’s a galore of interesting stuff to work on in regards to set preparation. To find out what that was like, I attended a work party, which the RPI Players hold at 7 pm on Fridays. 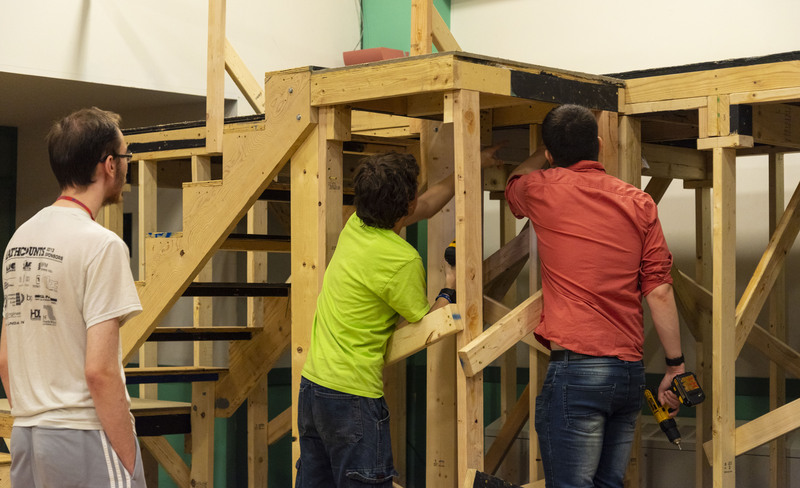 As I entered the RPI Playhouse, I was immediately surprised by how much work was going on—above me were students tinkering with lighting and sound equipment, in front of me were some students painting the stage, next to that were students working on carpentry. The first task I got to do was fetch a table that the Players were going to use as a prop. This gave me a chance to see the Player’s storerooms, one in the Darrin Communications Center, and one in Academy Hall, each filled with a plethora of equipment and props. After hauling the table to the Playhouse, we dismantled it using a drill. I’m not familiar with power tools, but this felt like a fun, approachable task to get started on. Speaking of power tools, there were several on the stage where the carpentry work was going on, including saws and pneumatic drills. If you have even the faintest inclination for carpentry, you’ll feel at home here. The night I attended, I helped them build one of the load-bearing walls for the back of their multi-story stage. As the night droned on, we drilled in one block of wood after another, taking careful measurements beforehand to ensure that everything would go according to plan. Finally, at the end of the night, most of that wall was complete. Throughout the night, the camaraderie between members of the Players was palpable and kept the work from getting monotonous. At 10 pm, we took a break to eat pizza—which was a welcome relief. Most members left soon after but a few stayed until 12:30 am to get more work done. All in all, the work party was a fun experience that gave me some insight into the inner workings of the RPI Players. Even if you aren’t particularly interested in drama or acting, there’s a lot you can do including directing, set design and production, costume design, and lighting and sound. You can watch Sweeney Todd on April 12, 13, 18, 19, and 20 at 8 pm and April 14 at 2 pm at the RPI Playhouse.